Apple's OS has built in internet sharing. Normally people use it to share out an ethernet connection to their smart phones or to share their smart phone connection with another set of hardware (imagine your main internet connection goes dead for example but you still have mobile: you can get your whole network back up again via internet sharing). 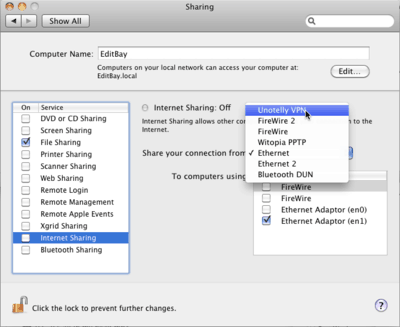 OS X internet sharing is a fantastic feature but doesn't seem to be compatible with VPN. When you add a VPN in to you won't be able to use the internet sharing and the DHCP server will go dead. In fact, sharing between two ethernet ports seems a bit trickier as well but isn't really. You just have to allow the receiving device to give what would normally be an error message. "Unable to obtain network address. Self-obtained network address." I've never had a successful connection with that message up but when sharing between two ethernet ports, that's the right message. You don't want to be generating additional network ID's. The Witopia Personal VPN is a great value, but watch out for tech support issues with WiTopia Pro OpenVPN SSL account. Same fast speeds on both. We have occasionally - say about once a month - had small problems with our cable internet (Chello.sk). We've been lucky - the longest we've been down is one and a half hours and most of the time it's less than this. 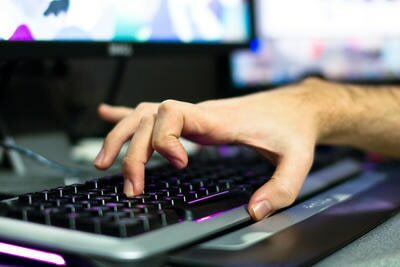 Even a single day with internet down for a whole day would cost the company three times more in lost productivity than the cost of the second high speed connection for the year. So we've done what every modern business should do. We now have redundant high speed internet from T-Com. Which is a good thing as our cable internet is down today. But no big deal, I just swapped the router over to the DSL connection and we were all ready to get back to work. Well, almost.